We’ve basically reached the halfway point in December, which means that it’s time for me to give my brain a break from blogging until New Year’s. I’ve started at a new school this year, and the vacation schedule is… different (I don’t know if I’ve ever had winter break start four days before Christmas), which means that I still have one more week to get through at work while still trying to juggle all the holiday stuff that’s become a tradition for Rachael and me (Holiday cards! Jam! Getting sick! ), and as typically happens around this time of year, something has to give. That doesn’t mean that I won’t be spending my time doing creative things for the next couple of weeks though. As I’ve begun documenting here, I’m learning how to draw, and over the holidays I’ve agreed to do a small bit of creative writing for an online community that I occasionally participate in. These are fun things! They also tend to sap the same time and spoons that I typically reserve for the blog, so it’s time to begin the winter hiatus. Ideally, I’ll also have some time to do more blogging in the next couple weeks as well so that I can start the new year off on the right foot. In terms of blog programming, I’m thinking about the fact that there are only five issues of The Wicked + The Divine left that are currently out (issue #41 is scheduled to hit stands in early January, so it’ll be six before I get that far) and what I want to do with the Wednesday slot next. I’m thinking about slotting in rotating issues of other comic series that I’m currently reading (I picked up the #1 of Kieron Gillen’s new series with Stephanie Hans, Die, and I’m smitten; also the Life is Strange miniseries by Emma Vieceli & Claudia Leonardi has begun releasing, and I am so here for it). Learning Sketchbooks are likely going to be a regular feature as long as I’m filling up my sketchbook with practice art (I’m not sure at what point it goes from being practice art to for real art), and as long as I can maintain interest in Final Fantasy XV I’ll try to continue doing logbooks of that playthrough. One off and topical posts seem unlikely to happen right now because I’m enjoying the predictability of ongoing series tied to exploration of a specific hobby, but a lot of that also depends on the news. I’ve enjoyed the last month of feeling like there’s slightly more sanity on the horizon for our national government, but it’s a fool’s game to try to predict that everything will be well enough that I won’t need to use this space to vent massive frustrations with the way of the world. Reflections of my educational practice might make a comeback if I do anything else this year that feels especially noteworthy; the fall slump is real, and it’s felt like mostly just surviving in class since like October. Anyhow, that’s enough from me. Enjoy your holidays, and I’ll be back here in the New Year. Seeing as we’re approaching the end of another calendar year, it’s probably time for me to take a short break. I know it’s time because I’ve been struggling to come up with anything to write about recently. This is a sure sign that I need to give myself some time off. So, in that vein, here are a couple things that I’ve read recently that I think are worth your time. I’ll be giving my own thoughts some time to stew in the mean time. “Chrono Trigger‘s Campfire Scene Is a Meditation on Friendship, Regrets, and Time Itself” – Chrono Trigger is a great game, and essays on its coolness for no reason other than to induce a collective nostalgia trip are always good in my book. “The Last of the Iron Lungs” – The problem of preserving old technology is one that I usually only see being discussed in relation to issues of old data storage and archival. This article explores what it’s like for people who are still relying on iron lungs to manage the consequences of surviving Polio when they were much younger. The Myths and Legends Podcast – I’ve been listening to this podcast for a couple months now on my commute. The host has a delightfully deadpan narrative style, and he puts a lot of care into researching and adapting the stories for easy consumption. As someone who’s struggled with trying to listen regularly to audio fiction, this podcast feels like a nice stepping stone in that direction. And that’s all for today. My brain is tired and my nose is stuffy, so I’ll check back in with everyone here later. I was ill with a cold and had a family gathering to go to this weekend (happy birthday, Dad! ), so I am out of time and energy for writing up anything worth reading this week. On the bright side, I have accrued over seven hundred thirty unique posts on this blog now, which means that if you wanted to, you could read something different that I’ve written every day for two years before you would need to repeat. I think this is a more interesting milestone than anniversaries (though my fourth one of blog writing is coming up in June) because time passes regardless of investment; it took work for me to put that volume of stuff out on the internet. So anyway, I’m declaring my prerogative to break when I want to. Work is in the stressful season with high stakes testing beginning (today, actually), and there are other things in my personal life that I’m trying to navigate which I’m not quite ready to discuss on the blog (in case anyone’s wondering, it’s all good stuff, so please don’t worry about my well being or anything like that). Here’s hoping that will change once summer gets under way. It’s the end of the calendar year, so I’m going to do a repeat of my hiatus from last year with the blog. I’ll do a year in review post around New Year’s before getting back to my regular schedule. I’ll probably continue doing my comics review posts (those are relatively easy to get into the pipeline), but otherwise I need to take some time to mentally recharge. This has been a long, tough year, and I suspect next year is also going to be tough, though perhaps in different ways. Happy Holidays to everyone; I’ll see you in the new year. Due to a series of high productivity, low mental energy days, I’ve not been keeping up with my regular blogging schedule. I need some time to recoup. In the mean time, go listen to the Hamilton soundtrack; it’s available pretty much everywhere on the cheap, but you can listen to it for free on Spotify if you don’t mind the ads. I should have my regular Sandman post up on Wednesday, but Friday may be another filler while I try to gather the energy to do some writing. Snow drifts settle in leaded panes, firelight glinting on glass. Around the table, warmed by well wishes, family gathers. Mother and father sit opposite, smiles radiating. They take in their son and daughter, home from school, and his mother, huddled under a lace shawl. The fire’s crackle soothes them all, its heat glistening their foreheads like the Christmas ham. Plates pass with potatoes and gravy, green beans and rolls. Each spoonful is a welcome, an “I love you.” The picture of winter bliss perfected. How I’d like to partake this year, every year. I’ll settle for tapping at leaded panes. I wrote this drabble for Loren Eaton’s annual flash fiction event Advent Ghosts. I’m not particularly happy with the result, but after more than a few false starts (one hundred words is hard!) I’m relieved to have something. After all, fiction writing is hard, and being able to put words down, even not great words, is an accomplishment. On a side note, I’m taking a break from posting for the duration of the holidays. I’ve maintained a steady schedule without any breaks for over a year, and I’m reaching that point where I just need to take some time to recharge. Regular posts should resume around New Year’s after I’ve had time to rebuild my backlog. I’m really looking forward to writing up my thoughts on the new Star Wars movie (I saw it on opening night and only got four hours of sleep before having to go work the next day, and I have no regrets), but that’ll have to wait until later. Of course, if any of my friends just want to talk about it, then I’m always up for that. Anyway, here’s to happy holidays for all, and a restful end to 2015. See you all in the new year. Today’s the last day of school for my students. I have two post-planning days scheduled for next week, and then my summer break begins (hurray!). To celebrate, I’m taking today off before I gear up for my break time blogging schedule. 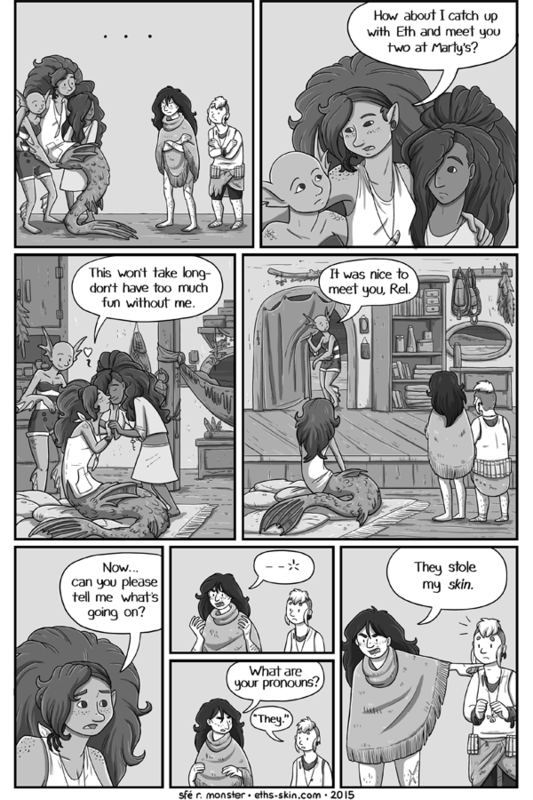 In the mean time, have a comic, courtesy of Eth’s Skin.